Several years ago a friend of mine came over to spend Easter with us and brought us some lovely colored deviled eggs. I’d never seen anything like it before! 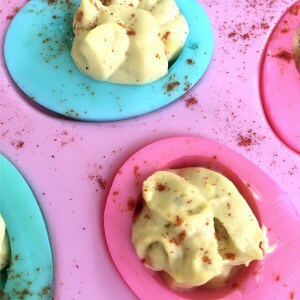 The deviled eggs looked liked colored Easter eggs. Last week I stumbled on a post that describes how to do it. It’s very easy! To make colored deviled eggs, first boil and prepare the eggs like you normally would to make deviled eggs. After the eggs have cooled, peel them, cut them in half, and remove the yolks. Gently rinse out the egg whites to make sure you have removed all the egg yolk. To color the egg whites, place them in individual bowls into which you have placed drops of food coloring. Let the egg whites soak until they are the desired color, approximately 30 minutes. To finish the deviled eggs, add mayonnaise and mustard to the egg yolks and mash with a fork until your desired consistency. Spoon the egg yolk mixture back into the egg whites and sprinkle paprika on top. Place on a pretty platter to serve. These are really fun to make for Easter. Your friends and family will be really impressed! They only take a few minutes longer to make then regular deviled eggs, so why not! ?